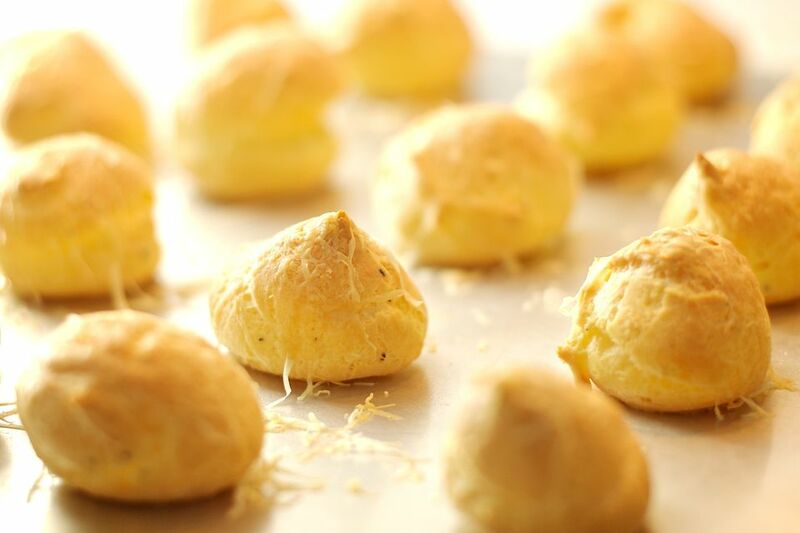 Gougères (pronounced "goo-ZHAIRS") are a French style of savory pastry made from choux pastry and some type of cheese. The most common cheeses for flavoring gougères are Gruyère, Comté, or Emmental. Baking gougères involves baking the pastries in two stages: an initial high-temperature stage which generates the steam which causes the gougères to rise; followed by the second stage at a lower temperature where the gougères finish baking. Gougères are traditionally made by piping the choux dough through a piping bag to form small balls (similar to the way cream puffs are made). But you can use a spoon, too. Because they're bite-sized, gougères are often served as hors d'oeuvres. And you can flavor them with herbs.